For a brief moment, I was five years old again in the small sandbox behind my house. I had my trucks moving around dirt as I built my marvelous edifice that would somehow make the world a better place. I glanced back at my desk and again became the older man, worried about health and finances, trying to do my job the best I can. Yet I have a great job. It is to write about people in the front lines fighting for a healthier America. It is to tell the stories of who have been touched, in one way or another by the Community Health Center. The most obvious stories are those of the person, down on their luck, between jobs, in need of medical attention and some unknown twenty first century Florence Nightingale or Clara Barton working in one of our health centers working together a great team saving the patients vision, limb, or life. The stories of these young nurses, Community HealthCorp members, and others who will see healthcare move forward beyond our lifetime are also worth repeating. Today, however, I have been given the opportunity write about a part of health care reform that is too often overlooked, the construction workers building new health centers across our country. Last year, as part of the Affordable Care Act, CHC received a $7 million grant to build a new facility in Middletown. Today, 120 yards of concrete is being poured. Donning a blue construction hat, I walked onto the site as CHC President and CEO, Mark Masselli spoke with one of the contractors. 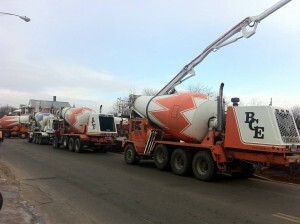 Hampton works for American Concrete Pumping, a Portland CT based firm. Hampton was talking about the 52 meter pump cable of pumping 210 Yards per hour. I must admit, I don’t know a lot about construction, so I picked Hampton’s brain for a little bit. He was proud to note that the rig is the biggest pump in the state. By being able to span the construction site, the general contractor could keep others workers employed in different parts of the pit while they were pumping making the operation twice as efficient. 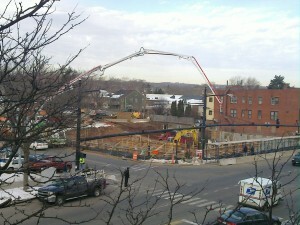 Today, they were pumping about 120 yards of concrete. When I think of a yard, it isn’t that much; three feet, or thirty six inches. 120 yards doesn’t sound like that much. Yet when you talk about a cubic yard of concrete, that’s pretty big, and heavy. A yard of concrete weights about two tons. 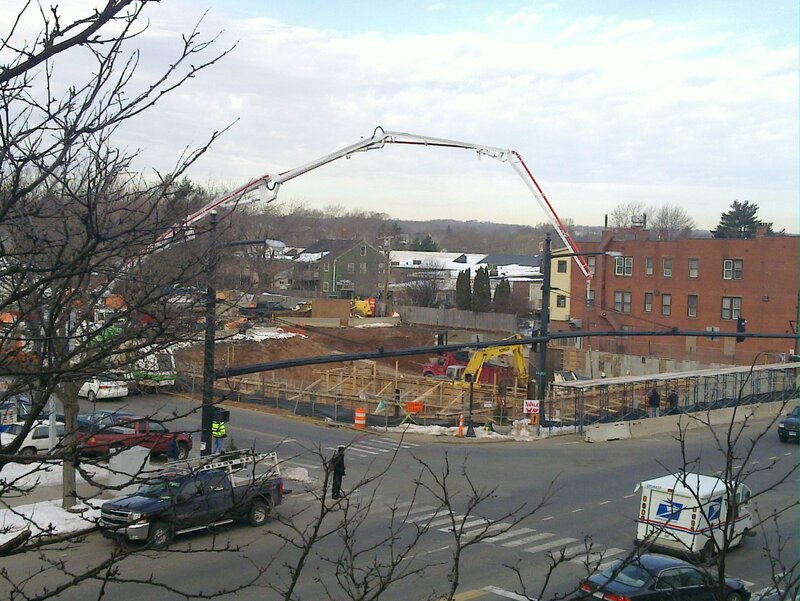 So, that would be 240 tons of concrete being poured today. A typical cement mixer can carry about ten cubic yards, or 40,000 pounds of concrete. We’re talking about a dozen cement mixers full of concrete, just for today’s pouring. So, the concrete mixers from Builders Concrete East of Windham, CT lined up this pouring to pour their concrete into the pump. Hampton, and the folks from American Concrete Pumping pumped it across the construction site and other workers kept about their jobs. At other CHC sites, the nurses and Community HealthCorps workers helped people find the care they needed and I returned to my office share the stories. It takes a lot of people working together on a lot of important jobs to build a healthier America and although I can’t move around the dump trucks or cement mixers like I could in my sandbox half a century ago, it is still wonderful to sit back and appreciate to work that everyone is doing.